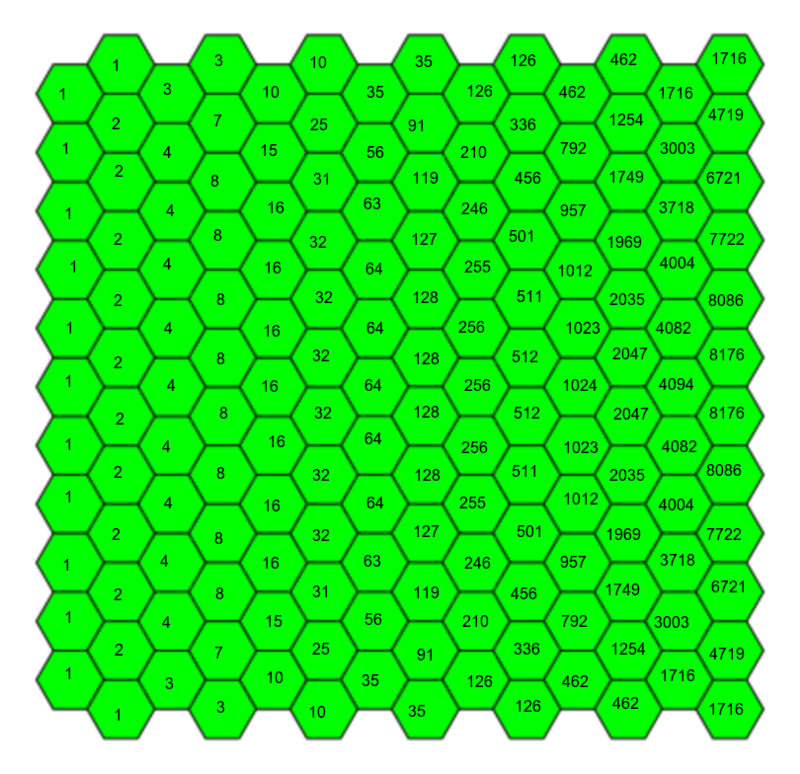 Here is a hexagonal tiling, borrowed from Wikipedia. I start in any hexagon on the left hand side. I end at any hexagon on the right hand side. I can only travel to the right, not up, down or backwards. In how many ways can this be done? Every cell in the first column can be reached 1 way. The sum of the numbers in the last column is the answer to the question posted. Well, I made a Pascal's Triangle-like chart with alternating 11 and 12 columns, and 14 rows, where each number was the sum of the two numbers northwest and northeast of it. I added all of the numbers on the bottom row. It's quite likely I messed up some addition, though. Consider the first 2 columns of this diagram. There are 11 starting positions, and 12 destinations. Each starting position can go to one of 2 destinations, so the number of possible paths is equal to $11 \cdot 2 = 22$. Now, consider columns 2 and 3 of the diagram. There are 12 starting positions, and 11 destinations. 10 of the starting positions have 2 possible destinations, and 2 of them only have 1 possible destination (the top and bottom ones). This means the total number of possible paths is $(10 \cdot 2) + 2 = 22$. If we now consider the first 3 columns, it can be seen that each of the internal starting positions has 4 possible paths, and the top and bottom ones have 3. Therefore, in total, there are $(9 \cdot 4) + (2 \cdot 3) = 36 + 6 = 42$ possible paths across the first 3 columns. In the initial consideration, the inner hexes were each finished on twice, and the outer ones once. Therefore, a second way to work out the number of paths in the third consideration, would be to edit the calculation for consideration 2 to be $((10 \cdot 2) \cdot 2) + (2 \cdot 1) = 40 + 2 = 42$. Next, considering the first 4 columns, each of the paths already determined for the first 3, has 2 more possible destinations, so the number of paths would total $42 \cdot 2 = 84$. Using these values, I can determine a formula for calculating the number of paths, where n increases by 1 for every repeating pair of columns. As there are 7 pairs of columns in the above image, (if my formula is correct), I believe there to be $83,746$ possible paths.